These sweet-and-savory little bites are perfect for Thanksgiving entertaining. In saucepan of cold salted water, bring sweet potatoes to boil. Reduce heat and simmer for 5 to 7 minutes or just until fork-tender; drain. Whisk together butter, brown sugar, maple syrup, thyme, salt and pepper in large bowl; add sweet potatoes and toss to coat. Preheat Kenyon City Grill® to medium. 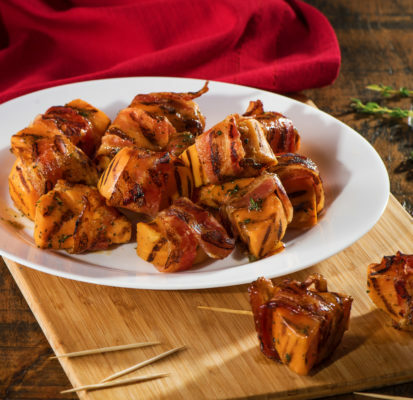 Wrap piece of bacon around each sweet potato piece and secure with a soaked toothpick. Grill, turning frequently, for 15 to 20 minutes or until golden brown and crispy.